Dating back to the middle ages, the Gion District of Kyoto is one of the city’s most famous attractions. History here is preserved well and is a part of the everyday scene. This is the place to see Geishas, enjoy traditional tea, and experience the ‘real’ Japan. If you’re visiting Kyoto, here are 7 things to do in Gion District. Visit Gion Corner to see several traditional shows. You’ll be able to catch a glimpse of Geishas, a tea ceremony, flower arranging, traditional Japanese music, and Maiko dance performances. The shows happen only on weekends and you’ll need to pay a small fee. They begin between six and seven in the evenings. 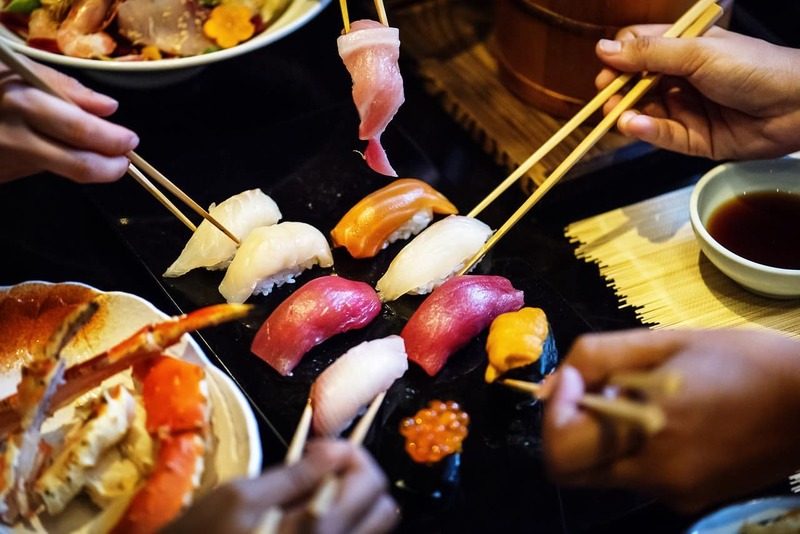 Japanese cuisine is well known and loved around the world. From sushi and curry to Ramen and tempura, eating is a top priority in this country. However, if you want to fully experience Japanese cuisine, the best way is to take a cooking class. Visit Cooking Sun in the Gion district if you want to learn how to make Sushi, Bento Box, or Izakaya. Also known as Gion Matsuri, this festival happens every July and is one of the most famous in Japan. The parade is the main event, but their are festivities going on several days throughout July. You will see people in traditional costumes, hear Japanese music, and have your choice of traditional snacks and food. During the festival, many traditional residences open their homes, giving visitors a chance to see true Japanese architecture. Founded in 656, this historic shrine is loved by locals and visited often by tourists. It’s both a symbol of Japanese Shintoism and a focal point of Gion. Entrance is free and visitors will get to witness traditional Japanese architecture and tradition. You’ll definitely notice these small wooden houses around the Gion district. They may look tiny, but they often are very long and have hidden courtyards. Many of these have been turned into bars and restaurants, making them a great spot to enjoy some sake. Try Gion Samboa or Tasuki. Japan is also known for its tea ceremonies and Gion is the epicentre of this tradition. Learn all about the rules and practices involved in a tea ceremony by experiencing one yourself. There are plenty of tea houses in Gion that offer true, Japanese tea, served by a professional. It’s a quintessential Kyoto experience. If you want to be sure to see a Geisha, make sure to take a stroll around Hanamikoji. Geishas are usually travelling down this street to get to appointments. If you do happen to spot a Geisha, make sure to be respectful and discreet with your photography. They are often busy trying to get to work so you shouldn’t stop them for a photo. Kyoto’s Gion District is the place to be if you want to experience real, traditional, Japanese culture. From food and tea to sake and Geishas, this area has it all. Get in touch today to discuss our Kyoto cooking classes and food tours.